My Heart Belongs on Mackinac Island: Maude's Mooring is a fabulous addition to Barbour Publishing's My Heart Belongs line. It is summer 1895 and Heiress Maude Welling disguises herself and works as a maid at the island's Grand Hotel. Journalist, Ben Steffens, comes to town and goes undercover as a wealthy businessman, trying to investigate a future story about gold digging men pursuing heiresses. Maude and Ben meet and begin to fall for one another. What will happen when the truth comes out about who they truly are? 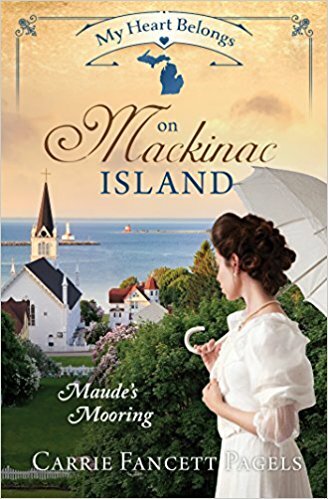 Carrie Fancett Pagels has written a winner with My Heart Belongs on Mackinac Island: Maude's Mooring. I love how she used the beautiful setting at Mackinac Island in the story. The descriptions of the island and hotel we're so vivid, that I felt like I was transported back in time. I just love the character of Maude, how she was so determined to become her own person and knew what she wanted. I was not sure how I felt about Ben in the beginning, but he grew on me by midway. A wonderful story of forgiveness, faith, and inspiration. Thanks so much, Amy! how can you beat a 5+ review, wow!!! I was up in Mackinaw City when this posted and I don't know what happened to my comment, but I'm trying again! Many blessings! Hi Carrie! Thank you for stopping by!